I am so delighted to join the Fuller Center again. This is the fifth year I have been cycling with FCBA, usually doing four or five weeks. Once involved, the Fuller Center becomes her life. They are your family for life. Today’s ride was from Craig, Colorado to Dinosaur, Colorado. The 88 miles was very hilly and hot. Pine trees are now being replaced by desert…making bathroom breaks quite difficult because there are no trees to hide behind. But what I saw most on this day, more than any other day was the sense of community. We are a people from all wakes of life, from all parts of the country, of all ages. Yet, we have ties that are so strong that nothing tears us apart and a constant effort to lend a helping hand to each other..
1, Lindsey and Cha Cha havre been sick the last couple of days. There is not one time that I saw either of these two without someone by their side, getting them anything they need. 2. I had my first flat and Mark immediately began changing my tire without me even asking. 4. Steve had a problem with his derailleur. So every effort was made to fix his bike. This summer, I housed five different riders at my home in San Diego. And I am not the only one. Once you participate on this bike, i have no doubt that if you show up on the doorstep of any other rider’s home, you will be welcome with open arms. The love, the care, the compassion we have for each other, is something I have never seen. The deep conversations about life that go on. We talk about struggles, weaknesses, accomplishments, dreams, and so much more. There is a willingness to share our feelings amongst us because of the trust that has developed. we are working not only on houses, but are also building strong relationship. Nothing is static….we are constantly at work,, whether it be cycling, helping others, or improving our own inner beings. 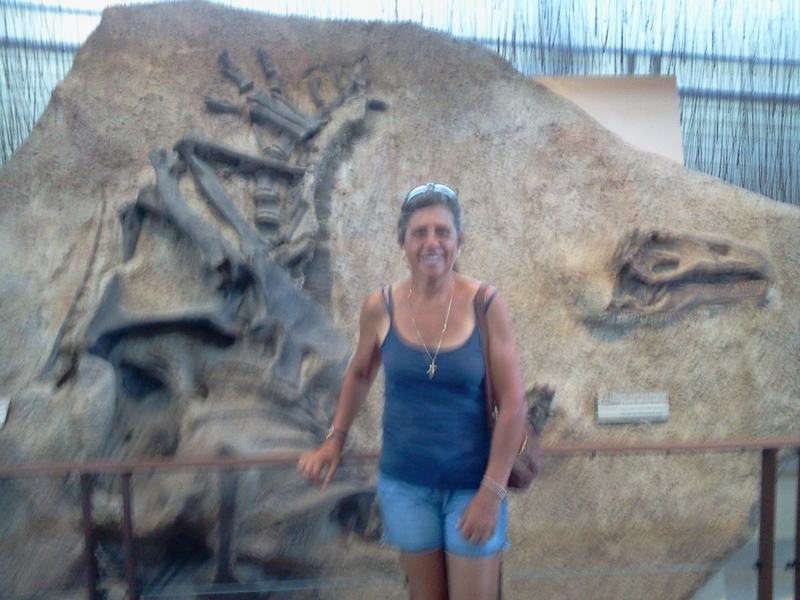 We ended the day with a visit to the Dinosaur National Monument. It was fascinating for all who decided to go to see the fossils of dinosaurs embedded in the rock Wow! Truly amazing….but not as amazing as all my fellow cyclists are on the ride. They are not just my friends, but my family for life.